• What is it? MLD is a gentle, non-invasive skin technique that assists lymph flow and aids in the drainage of lymph fluid from the tissues. • What is MLD used for? MLD is used to reduce the symptoms of Lymphedema, edema, Lyme Disease, Fibromyalgia, migraines, and digestive issues. MLD can bring about pain relief and reduce scar tissue. For health and beauty, MLD is used as a way to decongest and cleanse your body from the inside out. It detoxifies the tissues, and reduces puffiness. For Pre/Post Surgical, MLD prepares you for your upcoming surgery, and helps to decrease your recovery time after a surgical procedure such as plastic surgery, lipo-suction, dental, or orthopedic surgery. • Do the therapists use their hands or a machine? At The Therapeutic Alternative, we offer the European method of MLD. We use our hands to apply a specific skin technique to facilitate the movement of lymph fluid. We do not use a machine to give an MLD treatment. When indicated, we may incorporate dry body brushes and/or the LTU laser as an adjunct to our MLD treatment. • Can I schedule just one treatment or do I have to schedule a series? You are welcome to book one treatment. Depending on your current health, any medical conditions, recent or upcoming surgeries, or what your goals are, we can recommend how many treatments to schedule. Please note, that while one treatment is beneficial, in a series, the lymphatic system is more effectively engaged, and this in turn increases the body’s ability to eliminate lymphatic congestion. • How soon after surgery can I receive Lymph Drainage? As soon as the day after your procedure, as long as there are no contra-indications, and you have your Doctor’s approval. • Will the treatment hurt after surgery? No. MLD is a very gentle. Often clients are nervous because they have pain, soreness, and swelling from their surgery. However, after their treatment, they are amazed that they were able to be “touched”, and how much better they feel! • How long is a treatment? Generally, your first appointment will be for 75 or 90 minutes, and follow-up appointments are 60 minutes. Please note that the “hands-on time” is 50 minutes, 65 minutes and 80 minutes, as we have to allow time for the therapist to review your concerns, update notes on your condition, and time for you to get on and off of the table. • What is Ortho-Bionomy? OB is a gentle form of bodywork. It is based on a simple, but profound philosophy: Allow the body to correct itself. OB gently stimulates the body’s reflexes to self-correct in a way which supports the person’s own healing mechanisms. Please see our Therapy page for a full description of Ortho-Bionomy. • Is it like a massage? No, OB is unique in it’s application. No oils are used, and you wear loose comfortable clothing. • My Osteopath “adjusts” me. Do OB treatments adjust bones? No, we do not adjust bones. • What conditions are helped by OB treatments? The hallmark of Ortho-Bionomy is pain relief. • How long is an OB session? Your first appointment will be 90 minutes (intake & treatment) and follow-up appointments can 60 minutes, 75 minutes, or 90 minutes. Please note that the “hands-on treatment” is 50 minutes, 65 minutes and 80 minutes, as we have to allow time for the therapist to review with you your concerns, update chart notes on your condition, and to allow time for you to get on and off of the table. • What other type of treatments/therapies do you offer? We also offer Pre-natal massage. This treatment can be a blend of traditional Swedish massage, Ortho-Bionomy and MLD; your therapist will apply what best fits your needs. 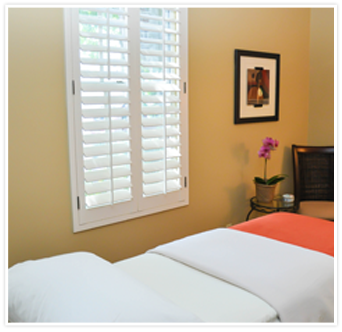 In addition, your therapist may include Dry Body Brushing of the skin, during a pre-natal treatment. • What are your fees? Our fees range from $80 to $150. Depending on your service, time scheduled, and the practitioner. We also offer discounts on Series packages. • Do you accept Insurance? We do not accept insurance. Please note, our Associate, Davis Sapper, OT,CLT is a Medicare provider. She specifically treats Lymphedema and bills Medicare for you. • What type of payment do you accept? We accept cash, checks, Visa, MasterCard, and Discover. • Please allow yourself enough leeway to arrive to your appointment unhurried, and on time. This will ensure you receive the maximum benefit from your treatment. Should you arrive late, please understand that we will provide your session in the time remaining. Your session will still end on it’s scheduled time, so our next client will not be inconvenienced. • Cancellation policy: In the event that you must cancel an appointment, notification to us of such cancellation must be received at least 24 hours prior to the scheduled date/time. This will allow our office to offer that time slot to another client. Your failure to cancel within the specified time frame can result in your paying the full fee. • Your comfort during your treatment is our priority. Please communicate all concerns with your therapist. Following any session, it is recommended that you drink water, and refrain from participating in any vigorous activities for the remainder of the day if possible. Alcohol is not recommended before, or after your treatment. • In consideration of our other clients, and to support our healing and tranquil environment, we ask that you silence your cell phone prior to entering our suite. Should you have to use your cell phone, kindly step outside to complete your call. • We also ask that you refrain from wearing perfumes/colognes, as we do work with clients who suffer from severe sensitivities.